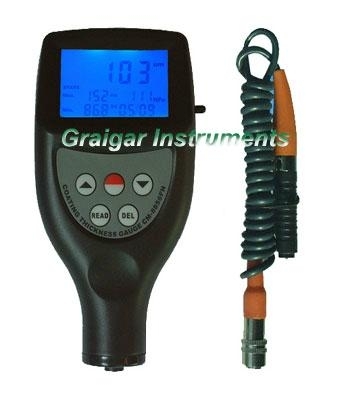 Coating thickness meter is widely used for measuring thickness and corrosion of pressure vessels,chemical equipment,boilers,oil storage tanks,etc.In industries of petroleum,shipbuilding,power station,and machine manufacturing. * It meets the standards of both ISO2178 and ISO 2361 as well as DIN, ASTM and BS. It can be used both in the laboratory and in harsh field conditions. porcelain enamel layer, phosphide layer, copper tile, aluminum tile, some alloy tile, paper etc. * The N probes measure the thickness of non-magnetic coatings on non-magnetic metals.It is used on anodizing, varnish, paint, enamel,plastic coatings, powder, etc. applied to aluminum, brass, non-magnetic stainless steel, etc. * Manual or automatic shut down. * Digital backlit display gives exact reading with no guessing or errors. * Can communicate with PC computer for statistics and printing by the optional cable. * Can store 99 groups of measurements. Bttery Indicator: Low batter indicator. Operation manual ............ 1 pc. F probe in built .................1 pc. NF probe in built...............1 pc.